Web identifiers such as usernames, hashtags, and domain names serve important roles in online navigation, communication, and community building. Therefore the entities that choose such names must ensure that end-users are able to quickly and accurately enter them in applications. Uniqueness requirements, a desire for short strings, and an absence of delimiters often constrain this name selection process. To gain perspective on the speed and correctness of name entry, we crowdsource the typing of 51,000+ web identifiers. Surface level analysis reveals, for example, that typing speed is generally a linear function of identifier length. Examining keystroke dynamics at finer granularity proves more interesting. First, we identify features predictive of typing time/accuracy, finding: (1) the commonality of character bi-grams inside a name, and (2) the degree of ambiguity when tokenizing a name -- to be most indicative. A machine-learning model built over 10 such features exhibits moderate predictive capability. Second, we evaluate our hypothesis that users subconsciously insert pauses in their typing cadence where text delimiters (e.g., spaces) would exist, if permitted. The data generally supports this claim, suggesting its application alongside algorithmic tokenization methods, and possibly in name suggestion frameworks. 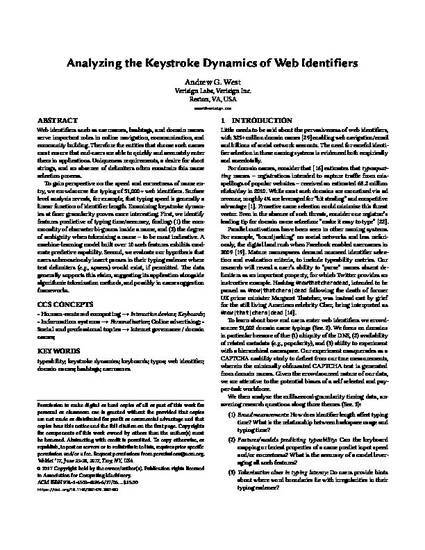 Analyzing the Keystroke Dynamics of Web Identifiers. Andrew G. West. In WebSci '17: Proceedings of the Ninth International ACM Web Science Conference, pp. 181-190, Troy, NY, USA, June 2017.